Stock Ghyll Force is a highly picturesque waterfall, reached through Stock Ghyll Woods, a short distance from the town of Ambleside , it drops around 70 feet into a bowl shaped pool. 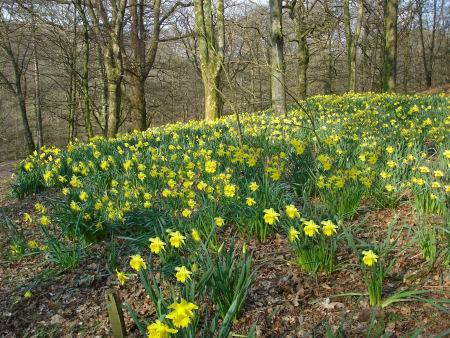 The waterfall can be reached via a short walk from the rear of the Salutation Hotel in the town and through Stock Ghyll Woods, which are carpeted with a profusion of colourful daffodils in the early spring. 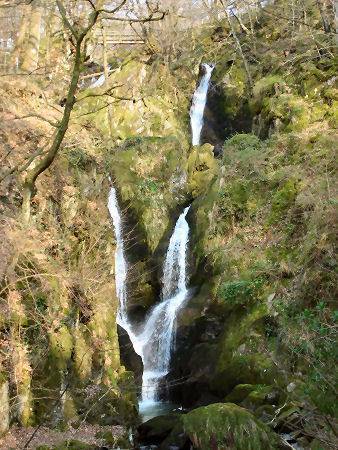 Stock Ghyll Force attracts many thousands of visitors each year and can be viewed in safety from a railed viewpoint. Stock Ghyll is a tributary of the River Rothay, it descends through a series of waterfalls to the centre of Ambleside. The ghyll once powered twelve watermills. The mills closed long ago, and most have now been demolished or been converted for other uses. The mill adjacent to the road is known as the Old Corn Mill, it stands on a site which has been occupied by a mill since 1335. Once the old manorial mill, it was rebuilt in 1680 by the wealthy Braithwaite family of Ambleside Hall. The building was restored in the 1970's for use as tourist shops. *Commmencing at the Salutation Hotel in Ambleside, pass between the bank and the Old Market Hall, now a restaurant. 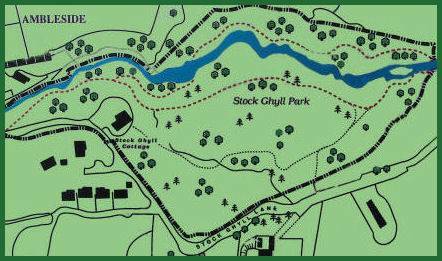 Turn left along a lane, Stock Ghyll should come into sight within a few yards. 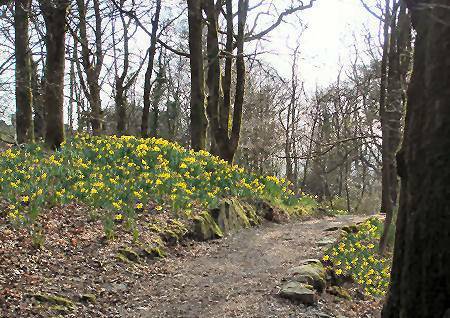 The road follows by the side of the tree lined park, enter Stock Ghyll Park when reaching the gate on the left. *Follow the path and bear left at the junction to cross the beck by a bridge. The path then climbs steeply through trees, leading to the top of the falls. At one point a path leaves to the right to an observation point over the falls. *From the top of the waterfall cross the stream by a bridge and follow the path down through the woods back to the gate.